Since teaming up with Artisanal Imports in November 2013 I’ve been able to try and in turn spread the word about the great line up of beers that they and their partner company Authentic Beverage Management import to the U.S.. One of my favorite beers that Alex Forbes, their Mid-Atlantic Sales Manager has introduced me to is Prearis Quadrupel, a 10% ABV quadrupel brewed by Vliegende Paard Brouwers at Brouwerij De Proef. 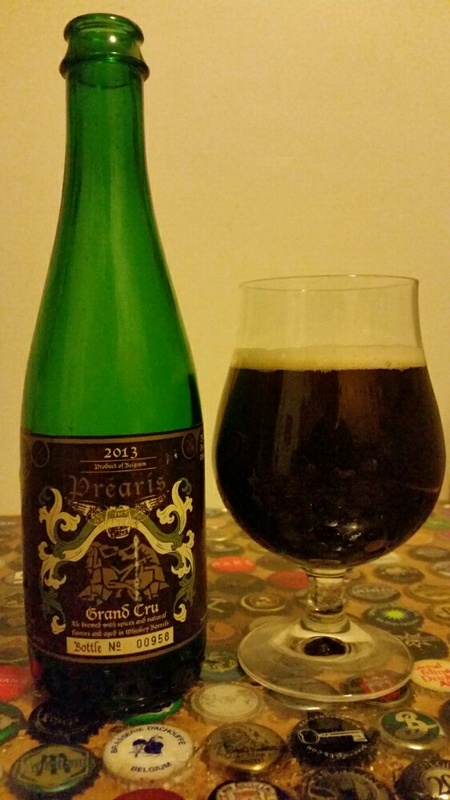 As such when I met up with Alex in December 2014 to try some Brazilian craft beers at NYC’s Beer Authority, I made sure to ask him to include both Prearis Quadrupel and Grand Cru (barrel aged quadrupel) in the allotment of review samples that he’d be giving me. Below are my reviews of both beers. Prior to opening and pouring this beer I was under the impression that it was aged in bourbon barrels. However, upon my first whiff I could tell that it was not. Some quick research and a closer look at the bottle’s label revealed that I had just poured the peated whiskey version of Prearis Grand Cru i.e. their quadrupel aged in Ardbeg barrels. It poured a true to style dark ruby red color with khaki cap of foam. Both the taste and aroma were dominated by earthy and smoky peated whiskey character which masked the based beer almost completely. At times I was able to pick up some dark fruit notes and a bit of caramel, but as the whiskey character was just too present. With a medium to full mouthfeel and moderate carbonation this beer was quite drinkable for its alcohol content and in turn kept me wanting to continue to sip more despite being perturbed by the whiskey flavors. I’ll conclude with the thoughts that I jotted down upon deciding not to finish the bottle. This beer is not for the faint of heart i.e. this is a really peaty beer. Despite my love of peaty scotches, not enough quadrupel comes through to balance out the beer i.e. it’s quite one noted. Perhaps a year or two of age will allow for this beer’s aroma and taste to reach a balance. Rating: 6.5/10, for how well the whiskey flavors were able to work their way into the beer. At times it seemed as if I was drinking Ardbeg scotch. 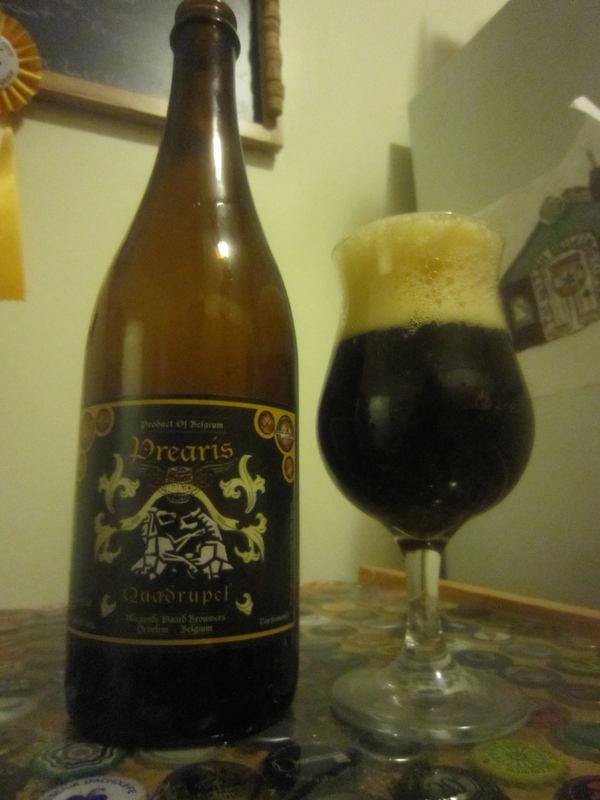 BREWERY’S DESCRIPTION: Préaris Quadrupel was crowned best craft beer (home brewed) Belgium 2011. This is what Paul Arnott, masterbrewer at Brewery Dubuisson mentioned: “What a maturity for a craft beer: all hearty, rich and balanced, very mature. A beer to enjoy!” Aroma: caramel, dark fruits. Taste: Malty roasted and chocolate malt slightLy bitter, dark fruits, caramel. Aftertaste: malty and mild bitter. As with many of the beers that I’ve been given to review I made sure to share this bottle (750ml) with friends…For me Prearis Quad presents with a blend of both traditional and more modern aromas and flavors. Meaning, while many trappist and abbey quadrupels are yeast driven beers with a phenolic spiciness that cuts through their flavors of dark fruit, caramel, and toffee. Prearis Quadrupel has far less phenolic spiciness and yeast esters and is instead balanced by sweet pie crust sweetness that complements its notes of dark cherry, toffee, and caramel. All of which reminded me of a traditional fruit pie that I’d eat during the colder months of the year. It’s alcohol content is hidden quite well and the grains that were used have given this beer an impressive smooth body. It is clear to me why this beer has won a variety of awards since it was first brewed in 2011. Rating: 8/10, I could see this beer appealing to beer drinkers of all experience levels. For a full list of the beers that Artisanal Imports imports visit their website. This entry was posted in Beer Reviews and tagged Artisanal Imports, authentic beverage management, Brouwerij De Proef, Prearis Grand Cru, Prearis Quadrupel. Bookmark the permalink.